who preaches salvation (Is 52:7). and that all nations may come to see your salvation. 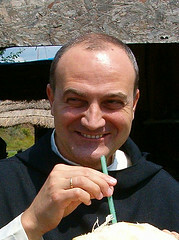 Padre Luca Maria Zecchetti, O.Cist. celebrates his onomastico today. 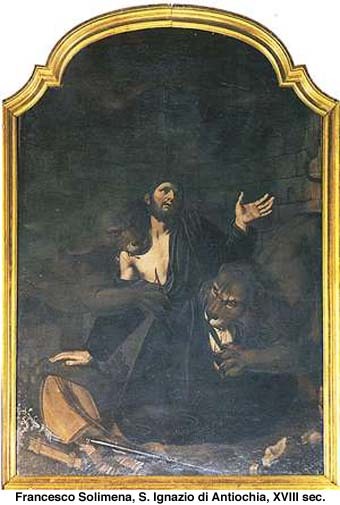 Don Luca, a native of Milano, is the prior of Santa Croce in Gerusalemme. He possesses seemingly boundless energy and needs it as the director of the famous children’s singing group, Le Matite Colorate. He is gifted with a magnificent voice and uses it well for the glory of God and the joy of all who hear him. Don Luca also looks after the abbey’s postulants and novices. Recently he undertook a journey to our new foundation, the Monastery of Santa Cruz in Guadalajara, Mexico. Join with me today in praying for him and in wishing him a happy feastday. Does Don Luca look unhappy to you? 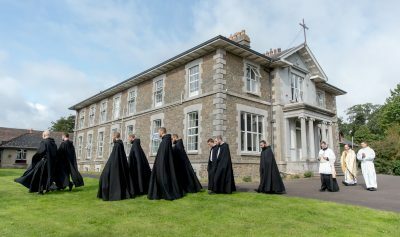 If you are interested in an expression of Cistercian–Benedictine life that unites the traditional monastic observances with the service of the Church, write to me. I actually sang part of my homily this morning. Yes, I did. I couldn’t help myself! I opened my Graduale and sang today’s incomparable Communion Antiphon, Frumentum Christi sum, for all to hear. The melody “grinds” the word molar, and then soars over the word panis. The chant melody is a mystical exegesis of the text. It is what I have been arguing for years: sung theology! 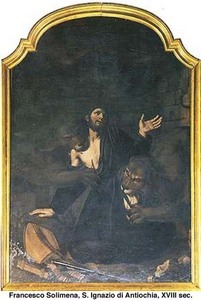 The image I chose today, an 18th century Latin American retable, does not depict Saint Ignatius of Antioch, but it does suggest something of his longing to become “purest bread” for Christ’s Holy Oblation. Read below what I had to say about identification with Christ, Priest and Victim. 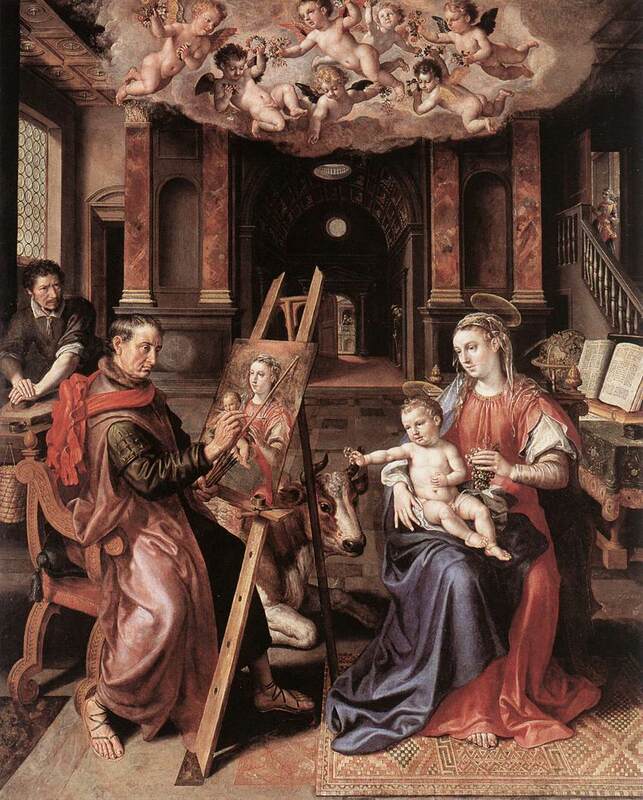 The power of the Rosary is utterly disproportionate to its simplicity. There is no grace that cannot be obtained, no Goliath that cannot be defeated, through the humble supplication of the Rosary. We do not hesitate to affirm again publicly that We put great confidence in the Holy Rosary for the healing of evils which afflict our times. 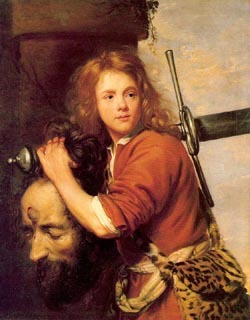 Not with force, not with arms, not with human power, but with Divine help obtained through the means of this prayer, strong like David with his sling, the Church undaunted shall be able to confront the infernal enemy, repeating to him the words of the young shepherd: “Thou comest to me with a sword, and a spear, and with a shield; but I come to thee in the name of the Lord of Hosts, the God of armies . . . and all this assembly shall know that the Lord saveth not with sword and spear, for this is his battle, and he will deliver you into our hands” (I Kings 17, 45-47). if so be I may find Christ Jesus. if only so be I may win Christ. who loved me, and gave himself for me (Gal 2:19-20).